No matter how brutal and nightmare-flecked the setting, no matter how many waves of unholy creatures assail the planet and no matter how unlikely it is that the young U'Kalthi pig farmer can triumph as humanity's final hope, there's always one ray of light in videogameland. Of all the clichÃ©s used in our favourite industry, the portrayal of medication and its relationship to health is one of the most reliable: A handy, insta-cure band-aid is as familiar as a comely elf-girl-next-door in a BioWare RPG. 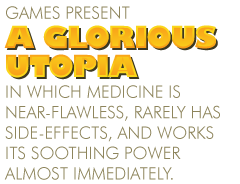 Games present a glorious utopia in which medicine is near-flawless, rarely has side-effects, and works its soothing power almost immediately. The Left 4 Dead universe is a grim and foreboding place, populated entirely by zombies, people who are about to become zombies, and enthusiastic, devil-may-care pilots. With that in mind, it's maybe not surprising that survivors are so keen to knock back entire bottles of pain pills. But it's a little more unusual that nobody suffers any ill effects from these decisions. Likewise, in Alpha Protocol, the only decision super-agent Mike Thorton doesn't have to agonize over is whether it's safe to consume every bottle of pain medication in Rome. Thorton's missions aren't so much a series of linear objectives as a calculated pharma-crawl from medicine cabinet to medicine cabinet. Fallout: New Vegas takes this even further, encouraging us to down weird concoctions of untested meds prior to tricky fights (presumably we ask the mutants and Deathclaws to hold off for a bit while we fiddle with child-safe bottles and wash the tablets down with irradiated water). Curiously, these drugs never react with one another in a catastrophic fashion. There's no ending slide with Ron Perlman soberly intoning "... and then the wasteland courier died from liver complications arising from a reckless diet of Med-X and Psycho." Sure, it's possible to get addicted to something and experience the highly realistic drug withdrawal effect of your virtual vision going wibbly for a bit. But guess what the instant cure is? Yet another form of medication, "Fixer." Out in the cold, crazy corridors of Dead Space 2, gaming's unluckiest engineer Isaac Clarke gets slashed in the face by innumerable eldritch horrors every other second, but a magic space-med cylinder will bring him back up to speed immediately.